While our party on the mainland is thriving, our party in Hawaii is broken. As HIRA uncovers the truth, y ou deserve to know exactly why we keep losing. The answer can be found in the kind of people Miriam Hellreich and Fritz Rohlfing and Pat Saiki surround themselves with. 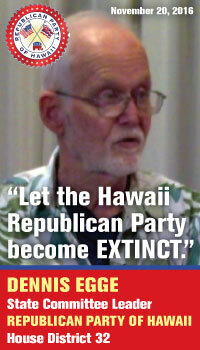 "Let the Hawaii Republican Party become extinct." Dennis Egge is the party's longtime RINO district chairman and state committee member for House District 32 ( Moanalua Valley, Salt Lake, Aliamanu). 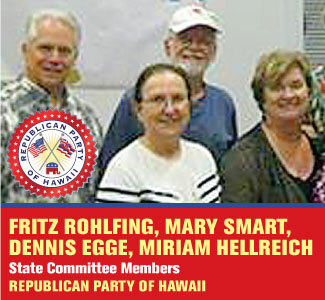 A longtime supporter of corrupt leaders Hellreich, Rohlfing, Saiki and Barbara Marumoto, Egge actually wrote those words above only days ago calling for the extinction of the Hawaii Republican Party. 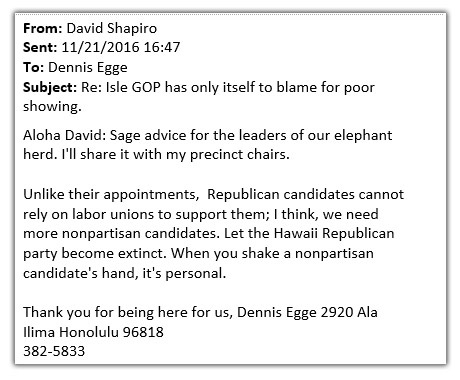 Here's his e-mail to liberal Honolulu Star-BirdCageLiner columnist David Shapiro, whose post-election column " Isle GOP has only itself to blame for poor showing " contained Shapiro's unmistakable conclusion that " The Hawaii Republican Party is dead ." OMG, when a party leader (1) agrees with the assessment that the party he is leading has died; (2) refuses to resign after helping to destroy the organization; and (3) says that the party SHOULD become extinct; and (4) plans to urge his precinct chairs to accept the same apocalyptic recommendation, we have a broken party which is in serious, serious trouble . . . especially since Dennis Egge represents the mainstream view of RINO's in our party's leadership positions. Yes, just like other party leaders from Team Hellreich, Dennis Egge is still in charge after many years. 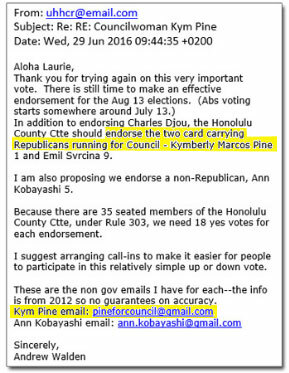 You might be interested to know that Egge didn't even bother to recruit a GOP candidate for his district in 2016, took no issue with how poorly our party is run, pushed to make the Hawaii GOP officially neutral on all the issues facing Hawaii, and even publicly endorsed Democrat Ed Case over Lingle for U.S. Senate in 2012 . Yet, despite violating party rules, Egge still hasn't seen his membership get terminated, nor be kicked off the Hawaii GOP's State Committee. THAT is precisely how corrupt and incompetent our party leadership has become. The kind of phony, party-killing RINO's and closet Democrats that Miriam Hellreich has routinely surrounded herself with in order to keep power after nearly 20 years. The people who have 'supposed to been' working toward Republican victory don't give a hoot about our party. They pretend to care (to keep power at the GOP) while undermining us every step of the way. Then, you have traitor Kym Pine-Ryglowski actively campaigning for Democrats this year and even donating the money from Republican donors to multiple Democrat candidates in 2016 - while Egge, Hellreich and Rohlfing ignored the matter to this very day -- refusing to terminate Pine's party leadership (which Andrew Walden, blogger and Rules Committee chair for Team Hellreich, says is still active). Instead, the party took steps to initiate the endorsement of Pine for re-election while she helped slaughter GOP candidates on the same ballot. This is the kind of corruption which is eating our party from the inside. Next week, HIRA will have even more sickening news to report. WHY? Because you deserve to know why we keep losing. It's clear from all the evidence that these RINO's actually lose elections on purpose!! And now they are planning to do it all over again -- with YOUR money!!! BEWARE of solicitations for money and sales of fake Trump-related events by these #NeverTrump party leaders. CAVEAT EMPTOR: Think long and hard about what they did with hundreds of thousands of dollars YOU gave them since 2014 . . . 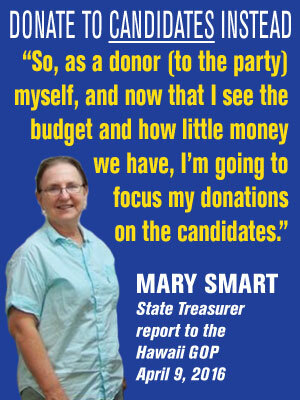 Remember the closed-door advice from current party treasurer Mary Smart: If you've donated to the party in the past, donate to candidates instead. The party is a mess. HIRA Action wants to rescue the Hawaii GOP from Team Hellreich. They are doing everything possible to let the Democrats win. 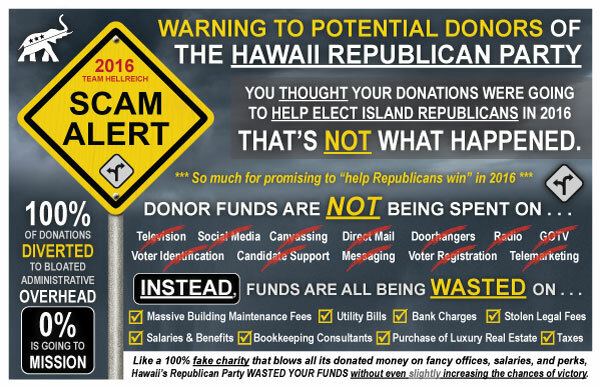 RINO's do want Hawaii's Republican Party to become extinct. On the other hand, HIRA Action wants Republicans to be the majority party in Hawaii. That's the BIG choice going forward.